Tucked away in beautiful Santa Barbara, a bit of historical elegance awaits you in this century-old, three story Queen Anne Victorian. 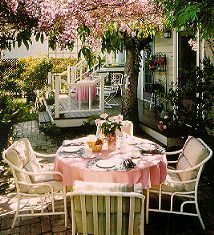 You will be transported to a time when life was not so frantic, a time of gentle conversation, leisurely breakfast and afternoon tea. Find a cozy, quiet nook in the house or garden to curl up with a book. Walk to downtown Santa Barbara, explore the shops and bookstores, eat at a sidewalk cafe. Write a page in your own history book! Twelve rooms all with private baths. Some feature oversize Jacuzzi tubs, gas fireplaces, balconies. Rates: $90-240 including breakfast, afternoon tea and evening wine & cheese.